Coca-Cola is determined to drain the village of Mehdiganj, India, dry despite a government order to shut down the plant for using too much water and violating pollution limits. According to Indian authorities, the groundwater level in the village has gone from “safe” to “over-exploited” -- the worst designation of groundwater, before it dries up completely --in the time the Coke plant has been operating. Mehdiganj villagers have been protesting against the Coke plant for years. The villagers' protests have escalated as their wells have dried up, forcing them to walk ever-greater distances for fresh water. As the water level drops, crop yields are dropping with it, sucking out the economic basis of the village and endangering the livelihoods of thousands of residents. Meanwhile, Coke has spent much of this year pressing for a massive expansion of the plant that would increase water use by five times. The company has shown that it is totally disconnected from the danger it is imposing on the village. Studies conducted by both the Indian government agencies and independent organizations have found that Coke has located many of its plants in water-stressed areas of India and bottling operations in these areas have threatened groundwater in many places. Furthermore, Coke plants have also been caught polluting the surroundings and selling toxic waste to unsuspecting farmers to be used as fertilizer. After years of watching groundwater levels drop dramatically, Mehdiganj villagers finally have Coca-Cola on the defensive. One villager, sixty year-old Savitri Rai, says police beat her when she first began protesting the plant a decade ago. In June this year, under pressure from the community, the government ordered the Coke plant to be shut down for a number of violations. Coke has appealed the closure in the courts and has been allowed to temporarily operate while the courts consider the appeal. 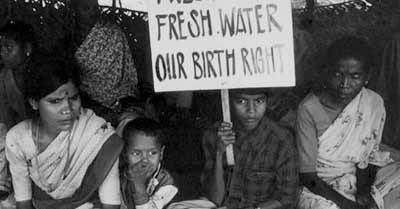 Meanwhile, a massive expansion that Coke had been planning, which would greatly expand the rate at which it sucked up Mehdiganj's water, was permanently denied. While there is no denying Coca-Cola's enormous set of resources, we have people power on our side. In joining in solidarity with the people of Mehdiganj, our Community can influence global public opinion and help villagers secure access to clean, safe, local water. Water is becoming an increasingly scarce resource around the world. Many corporations argue that they are free to use as much water as they want, even if it makes entire areas uninhabitable. Careful stewardship of our resources is at the heart of our Story, ensuring that we'll be around to continue telling stories long into the future. The Story of Stuff Project works to draw connections between the cycle of production and consumption and its impact on society. By joining in the stories of communities such as Mehdiganj, we can help illuminate the impact that corporations like Coca-Cola have on peoples’ lives. Coke tries to bill itself as a socially responsible company but our Community has the power to expose its dirty practices to customers worldwide, bringing much-needed pressure for positive change. When our Community unites behind a cause as important as this one, we can create a force that can’t be ignored.